Jim Steranko created this dialogue free and almost completely wordless page for Nick Fury: Agent Of SHIELD #2, circa 1968. The Comics Code Authority changed the final panel from an image of Fury and the Contessa embracing to the perhaps actually more suggestive panel of the gun placed snugly in it’s holster. The Code also put the telephone back on it’s hook, it had been depicted as removed. 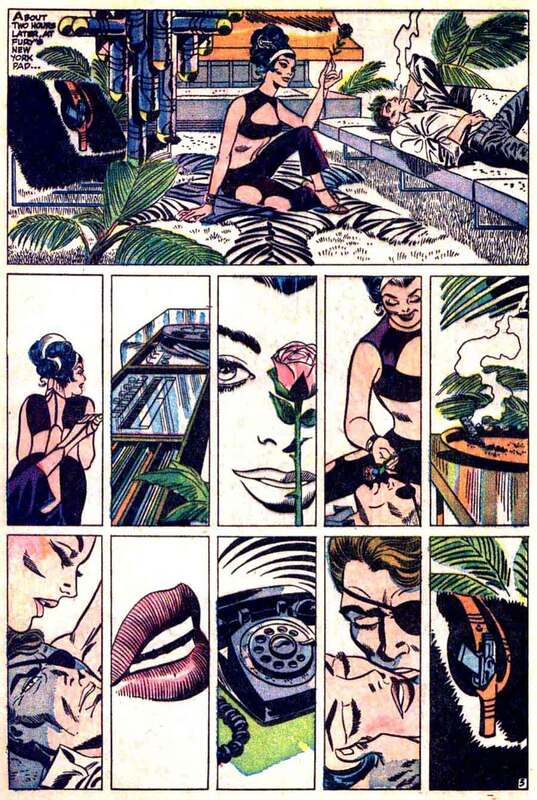 Steranko has been known to quip that he now finds telephones found off their hooks to be very exciting. It’s been said that you should never meet your famous heroes, but I can only recommend it. I’ve met most of mine that still walk the earth and had golden experiences. Perhaps I’ve been fortunate, but as Robert Evans likes to say, “Luck is when preparation meets opportunity.” My advice is simple: ask good questions. My first query for Jim Steranko proved to be an easy one. “What’s the record on the hi-fi in this scene?” I had imagined Sam Cooke’s That’s Where It’s At, a slow burning number that lyrically describes what you see on the page before you. I guessed wrong. Without a moment’s hesitation, Steranko delivered the answer: Eddie Lockjaw Davis, a saxophone toting jazzman. The mistake I made was to look for words and lyrics when the mood and music is the heart of the matter. This exchange was my first step on a trip I had been planning for years, for the time I had the emotional maturity to take it. Time to get into Instrumental Jazz. Growing up on Pop, Soul, Rock & Roll, and some Standards and Vocal Jazz in more recent years, the work of guys like Miles Davis and John Coltrane eluded my grasp the way foreign films are beyond many of us. I admired the zen of the people I’ve known who dug it and equated the music with a certain attitude. By no mistake, the term cool as used to denote a state of mental and emotional being originates in Jazz Culture. There’s an unfortunate attitude sometimes found that to be into Jazz, one must reject everything else but classical as beneath them. That pretense is poison. Look no further than Miles Davis covering Cyndi Lauper’s Time After Time for proof in the fallacy of that mindset. A variety of musical genre is a must for a healthy mind. You wouldn’t just consume one kind of food throughout a life well lived. The same holds true for music, nutrition for the soul. No one wants sushi for breakfast, just after brushing their teeth and before going off to work. In a similar mode, Jazz has certain situational conditions in order to work it’s magic. I’ve found that it’s best between 8 PM and 4 AM, or sometimes on a Sunday morning. If you’re alone, it would be best to be reading, writing, maybe smoking something. Driving in a metropolitan or urban area. If you’re not alone, you want to be making love or conversation. Or both. In any case, the music should settle nicely into a background. If you can interact with interesting people at nothing much louder than you would in a silent room, it’s going to work out fine. The best tastes are those acquired. It’s no coincidence that those are usually the kinds that are treasured the most. Looking back over your life’s loves, I would bet that you will find the best spots in your heart are held by the things that challenged you.